The mouse went down on the panel. Optional parameter: mouse position relative to panel. The mouse was released on top of the panel. Optional parameter: mouse position relative to panel. The panel was clicked. Optional parameter: mouse position relative to panel. Group of widgets that has a background color and optional borders. When contentSize is set to (0,0), the content size is determined by the child widgets of the panel. Makes a copy of another scrollbable panel. Creates a new scrollable panel widget. This function does not return the absolute position of the ScrollablePanel. 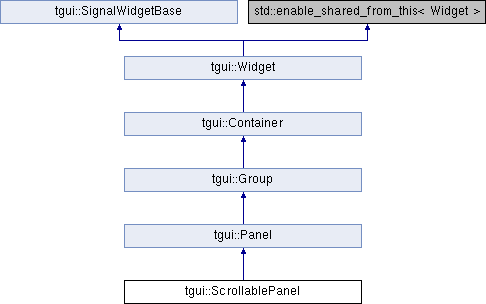 It is implemented in a way that allows calling getAbsolutePosition() on a child widget of the ScrollablePanel to work. Returns the amount of pixels the child widgets have been shifted to be displayed by the scrollable panel. Returns the size available for child widgets. Returns the width of the scrollbars. Channges the size available for child widgets. If the content size is larger than the size of the panel then scrollbars will be displayed. When the content size is (0,0), which is the default, then the content size is determined by the child widgets. Changes the width of the scrollbars. Changes the size of the panel.